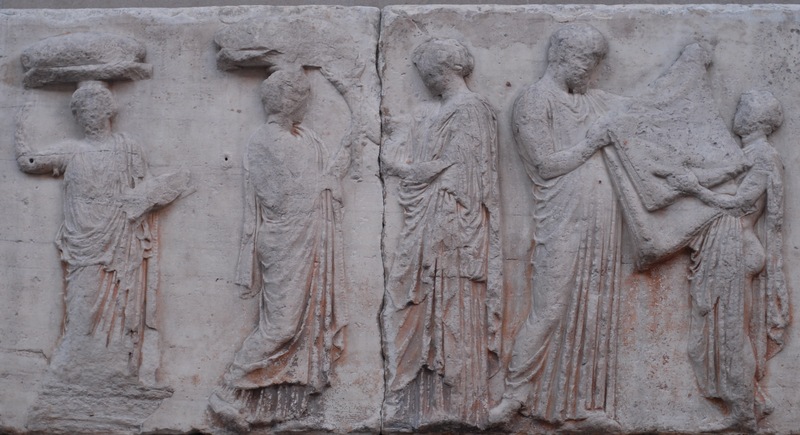 So-called “Peplos Scene” from the east Parthenon frieze (panels E31-35). The scene may depict the peplos garment being folded by a child (perhaps a weaver) and a chief priest. Mansfield believes that this image depicts the smaller peplos/robe of the annual Lesser Panathenaia. A few weeks ago, I was doing some research on the traditional Greek garment, the peplos. Each year a special peplos was woven to decorate a statue of Athena on the acropolis of Athens. This garment was woven in celebration of the Panathenaic festival that took place every year in honor of Athena’s birthday. The typical annual celebration is called the Lesser Panathenaia, and every four years a spectacular celebration, the Greater Panathenaia would take place. 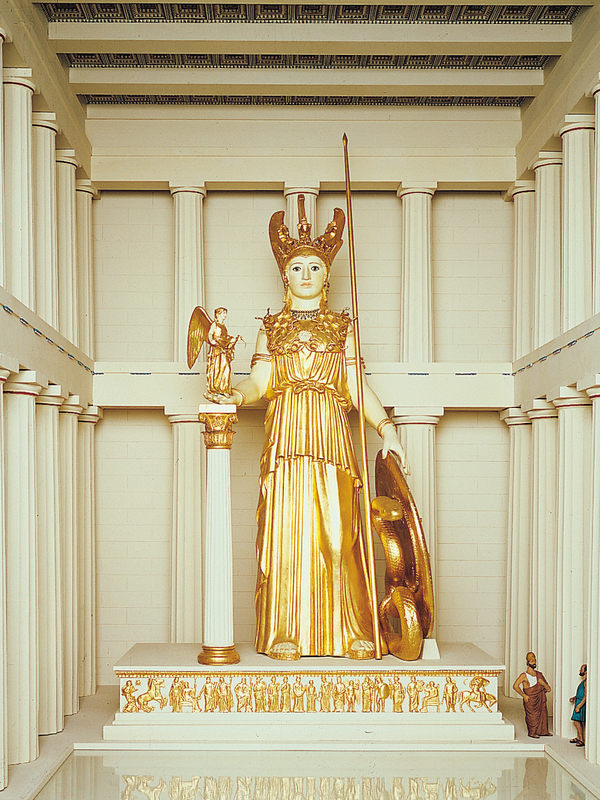 Phidias, model of Athena Parthenos (now lost) within the Parthenon, ca. 438 BC. Statue was approximately 11-12 meters (about 40 feet tall) and made of gold and ivory. Up until a few weeks ago, I didn’t realize that this special Panathenaic peplos was a topic of deliberation among scholars. I thought that only an ancient wooden statue of Athena, called Athena Polias, was the only statue of Athena that was decorated for these celebrations.1 However, I came across a website which explained that an additional peplos was made every four years for the Greater Panathenaia celebration, and this different peplos was created for the monumental, chryselephantine (gold-and-ivory) statue of Athena Parthenos that Phidias created for the cella of the Parthenon. Incredulous, I wrote the owner of the website to ask for more information. He directed me a dissertation from 1985 by John Magruder Mansfield. I also found a 1992 exhibition catalog called Goddess and Polis: The Panathenaic Festival in Ancient Athens. It is difficult to know the specifics of how these peploi appeared and how they were used, beyond textual documents. For one thing, the woven cloth no longer exists. 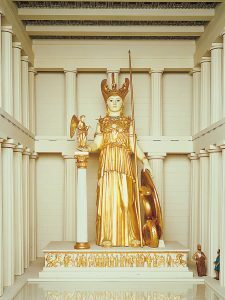 Additionally, the statues of Athena Polias or Athena Parthenos do not exist today either. But the process of weaving these tapestries and using them in conjunction with sculpture is still important to art historians, so we can learn how art was produced and how it functioned in ancient Athens. John Magruder Mansfield, The Robe of Athena and the Panathenaic “Peplos,” PhD dissertation (University of California, Berkley, 1985), 16-17. See also E. J W. Barber, “The Peplos of Athena,” in Goddess and Polis: The Panathenaic Festival in Ancient Athens by Jenifer Neils, ed. (Princeton, New Jersey: Princeton University Press, 1992), 114. Mansfield, 5-8. See Ridgway, 123. Barber, 114. See also Mansfield, 47, 71-74. D. Lewis, “Athena’s Robe,” Scripta Classica Israelica 5 (1979-1980): 28-29. This entry was posted in Art History, Greece, History. Bookmark the permalink.